An exfoliating and draining treatment whose main ingredient is very fine salt crystals which eliminate dead cells and stimulate natural skin renewal. By attracting water these crystals produce a strong draining and slimming action. The skin’s grain is smooth and refined. The presence of precious oils like Argan and Wheat Germ guarantees that even the driest skins will receive the necessary nourishment and comfort. A rapidly absorbed body milk which provides excellent sensory comfort even to the most reactive and dehydrated skin thanks to a high concentration of nourishing oils like Jojoba, Argan and Wheat Germ. Great after baths or showers, it is also excellent as an after-sun lotion. A rapidly absorbed cream, which thanks to plant extracts of liquorice, citrus, agnus castus and cherry, has a powerful lipolytic and draining effect which is also helpful in cases of venostasis. Improvements in skin blemishes caused by cellulite are already apparent after the first applications. Can be safely used even during pregnancy. This cream has a firming and elasticizing effect on cutaneous tissues thanks to active plant ingredients extracted from rice and soy. The high concentration of gardenia stem cells combined with an innovative liposome complex not only improves skin tonicity but also any stretch marks that may be present. A delicate exfoliating treatment whose main ingredient is finely ground hazel seeds. Suitable for all skin typologies, it can be used twice a week at night after your customary face washing. In addition, the presence of glycolic acid allows for the elimination of excess sebum and impurities. Afterwards, the rebalanced skin is smooth and silky. This toner allows the skin to completely absorb the active ingredients contained in the treatment creams applied subsequently. It gives the skin tonicity, compactness and regenerates it thanks to gardenia stem cells. Use after washing both morning and evening. A rinse-off cleansing milk which cleans the face and neck without dehydrating the skin. It does not contain sodium lauryl sulfate and its natural non-aggressive cleansing ingredients are extracted from coconut. Suitable for all types of skin, it is also an excellent eye makeup remover. An ultra-light serum which is recommended for normal/combination skin even in the presence of acne. Its anti-inflammatory and sebum-balancing action is due to the presence of lilac stem cells which are capable of inhibiting both inflammatory processes and the overproduction of sebum. This treatment is excellent for use in the morning as a makeup base. LILAC: anti-inflammatory action; regulates sebum; reduces acneic lesions by 40% after 30 days of treatment, with a significant decrease in inflammation and melamine pigmentation. This concentrated anti-aging serum has the ability to prolong the nourishing and anti-wrinkle action of the other treatments in the product line. 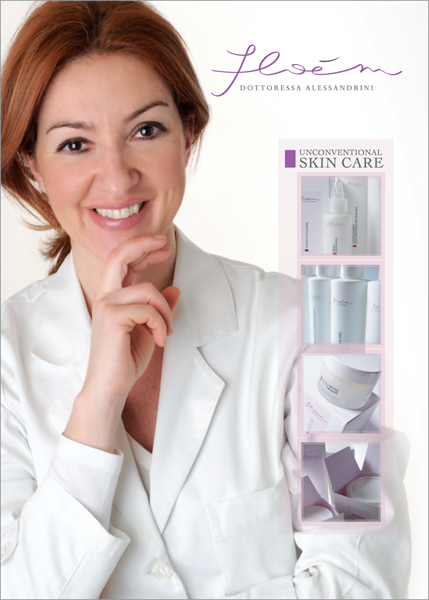 The firming effects of soy and the antioxidant effects of Vitamin C work in synergy with hibiscus extract, the latter of which acts on expression wrinkles, while the edelweiss stem cells which enrich the formulation exert a very powerful action on the deepest wrinkles and repair the damaged dermis while promoting self-renewal capacity. Its application under the night cream is especially recommended. A specific eye contour treatment whose anti-wrinkle and firming action is guaranteed by the presence of proteinic derivatives extracted from soy and hibiscus. Edelweiss stem cells repair and regenerate the skin in the periocular area (which is especially thin and subject to continuous stress). The formulation is completed and enriched by concentrated extracts of arnica and bilberry which, possessing draining and capillary-protecting properties ensure an effective decrease in bags and rings. EDELWEISS: contains potent antioxidants like leontopodic acid and other anti-inflammatory substances. It is cytoprotective along with being an antioxidant, anti-hyaluronidase and anti-collagenase. Reduces the depth of wrinkles by 15% after 20 days of treatment. In particular, it: 1-reduces wrinkles around the eye contour area 2) restructures, tones and reconditions skin tissue 3-prevents aging: HIBISCUS contains a complex of oligopeptides which through an antioxidant action works to reduce muscular contraction and expression wrinkles. A new and exclusive high-potential serum which is rapidly absorbed and whose texture is very fine. Essential for all skin typologies, it contains a special hyaluronic acid which is very pure and capable of penetrating deeply while producing filler and lifting effect which is immediate but natural. Provides sensorial comfort to skin and visible turgor to features. Protects the cutaneous hydrolipidic film from external aggression. It has a strong detoxifying power; the skin appears more relaxed, compact and smooth. Used in conjunction with the product line’s treatment creams, it exerts a synergistic action which notably increases the effectiveness of the ingredients. As a makeup base it is incomparable, being that like a primer it considerably increases performance and hold while allowing the skin to breathe! This anti-aging cream is rich in gardenia stem cells which encourage the synthesis of collagen fibers and protect against their deterioration. In addition, the presence of powerfully firming soy proteins makes it perfect for skin which is very atonic and in need of nourishment. It’s a 24-hour cream that can be applied both day and night. This mask is rich in emollient and soothing substances which over time restore even the most stressed skin to its correct level of hydration. The presence of gardenia stem cells, Vitamin C and olive oil derivatives make this mask an extraordinarily nourishing and anti-oxidative treatment which restores tonicity and brightness to even especially dry and sensitive skin. GARDENIA: acts mainly on the loss of collagen, in particular: 1- it increases collagen synthesis 2-it reduces collagen degradation 3-inhibits collagenase synthesis, that is collagen degradation, thus preventing the loss of tone. This absolutely innovative cream is effective thanks to a high concentration of a group of active ingredients: regenerating and revitalizing rhododendron stem cells protect the dermal cells from oxidative environmental stress; magnolia extract is able to counteract free radicals; a liposomal fraction of the high content of phosphatidylcholine is excellent as an anti-aging nutrient, while very pure Vitamin C is a great antioxidant and lightener. Finally, a peptide derivative extracted from viper serum produces a strong relaxing action on even the deepest wrinkles.